The Big Four companies refers to the four largest international accounting firms. They are actually professional service networks that offer auditing, taxation, advisory, actuarial, financial consulting, legal and other services for businesses worldwide. Provided by the big four firms, professional networking services are a network of corporations that work together to set auditing standards. Although they may not follow Intuit stock, you can be sure they have used their products in one form or another. In fact, the four companies provide auditing services for 99% of the Financial Times Stock Exchange (FTSE) 100 companies. Moreover, they provide employment and career options on a large scale, similar to Capital One Spark Business or similar big-name companies. The Big Four originally started out as the Big Eight made up of Arthur Anderson, Arthur Young & Co, Coopers & Lybrand, Ernst & Whinney, Deloitte, Haskins & Sells, KPMG, Touche Ross and Price Waterhouse. Mergers turned them into Big Six, then Big Five and finally, into Big Four. The Enron scandal and the demise of Arthur Andersen eventually led to the formation of the Big Four. 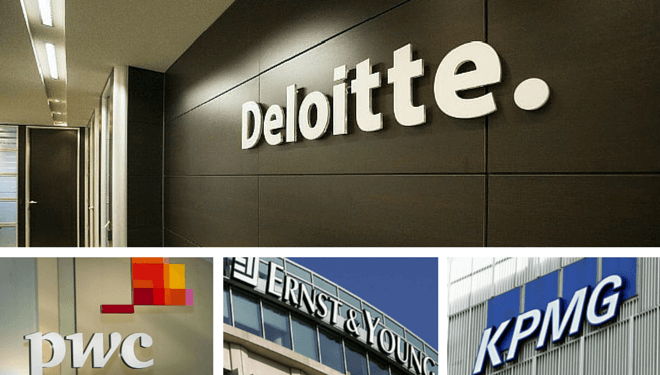 The Big Four companies are now Deloitte Touche Tomatsu Limited, PriceWaterHouseCoopers (PwC), Ernst & Young (E&Y) and Klynweld Pete Marwick Goerdeler (KPMG). Why Are They The Big Four? These companies are referred to as The Big Four because they are the accounting firms with the largest revenue in America. They are also responsible for almost all of the audits that are done for publicly-traded companies. That is what makes them not only such high performing companies, but also the most prestigious in the field. Although Deloitte and PwC vie with each other for the first position, Deloitte is now the biggest of the four. Founded by William Deloitte in 1845, the company retained its brand name even after several mergers. AccoutingVerse notes that the firm earned $34.2 billion and had nearly 210,000 employees spread across 150 countries in 2014. It has consistently excelled in auditing, tax, consulting, financial advisory, risk management and consulting services worldwide. Deloitte is constantly listed in Fortune magazine as one of the best employers to work for. Samuel Lowell Price started this company in 1849. A merger of two large accounting firms, Price Waterhouse and Coopers & Lybrand in 1998, led to its expansion. Their aim is to provide value oriented services and build good customer relations, as is any other S corps aim. The firm is never far behind Deloitte in terms of earnings and rankings. According to AccoutingVerse, PwC earned $34 billion in 2014 and employs more than 195,000 employees across 157 countries. PwC also offers a range of services including auditing, assurance consulting, tax services, and others. According to Diversity Inc. magazine, it is the second best large company to work for. Ernst & Whinney and Arthur Young merged in 1989 to create EY. It ranks third among the big four companies and has member firms in over 150 countries. The company’s core values consist of integrity, respect, motivation, and team work. EY prices knowledge and skills development as well. The firm offers tax, advisory, assurance and other services. In 2014, the company earned $27.4 billion. Diversity Inc. magazine consistently rates EY among the top five best companies to work for. Peat Marwick International and Klynveld Main Goerdeler merged to form KPMG in 1987. It employs around 167,000 employees in 150 countries, some of the best workers in the accounting talent pool. In 2014, it’s earnings amounted to $24.8 billion. It provides audit, tax, advisory, and industry-specific services. KPMG highly values its people and aims for quality of service. Diversity Inc. magazine ranks it at 23 among the best employers. It promotes a culturally diverse work environment, and is known to work with struggling companies, as well. The big four accounting firms are recently making a move toward bringing on many, many more partners. In the past year, KPMG alone promoted 27 executives to the partner title. PWC is no different, in the last two years the company has made no secret of their mid-level executive poaching from other big four firms with the promise of partnership. In recent times, the number of partners in the big four firms for accounting have nearly doubled. Clearly, this trend has gained some ground. However, most of these new “partners” still only make a salary. So are more executives becoming partners? Or has partnership simply becoming a trendy new title to throw around to keep executives happy? We will let you decide that for yourself. The big four companies all offer excellent employee leadership training programs, campus recruiting and recognized programs for prospective employees. Their outstanding performance and employee friendly policies are remarkable. Furthermore, the Big Four’s values, integrity, and commitment to excellence in service has helped them maintain their standing in the industry.